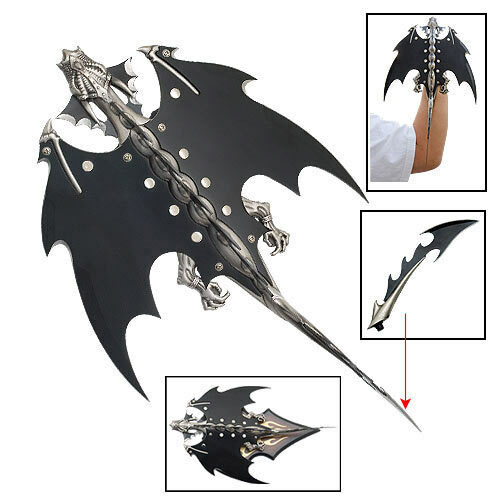 Flying Dragon Claw | BUDK.com - Knives & Swords At The Lowest Prices! An out of this world innovation that is constructed with such amazing craftsmanship, the dragon's body is solid stainless steel construction with a hard black anodized finish. His wings, spine, and tail offer intricately cut spikes and edges that scream for attention. The removable tail is an added feature offering small push dagger action. Features a custom hand grip that fits your palm perfectly. The wooden display holds the dragon in an upright, ready for flight position. Includes wooden display stand. 15 3/4" overall.